On 3rd January, WWE aired the first Smackdown Live of 2017 from Jacksonville Veterans Memorial Arena in Jacksonville, Florida, USA, headlined by a contract signing between John Cena and AJ Styles for their World Championship match at Royal Rumble. With Intercontinental Champion The Miz, Dolph Ziggler, Dean Ambrose and Baron Corbin also on the show, could the Smackdown brand begin 2017 as they meant to go on? So as you can see by the picture of ol' Borboun Corbin above, he got himself all involved in AJ Styles and John Cena's contract signing, but there was like fifteen minutes of content before Corbie got involved, so I'm gonna talk about that first instead. Styles and Cena were both on fire throughout this, after being introduced by General Manager Daniel Bryan. Styles' promo focused on Cena's part-time status, bringing up some of Cena's comment from his feud with The Rock, before landing on a brilliant exclamation point "You will never be as good as The Rock...and you will never be as good as AJ Styes". Whilst the content of Cena's promo wasn't quite as strong, his spirited delivery made it difficult to ignore as he exploded back at The Phenomenal One with a promo about passion, showing real energy as he stepped up to sign his contract. These two together are gold, in almost every aspect, there's still a tonne of content that could be potentially mined before the Rumble also! Baron Corbin turning up just when it looked like Styles and Cena would come to blows was an interesting development, but one that is pretty transparent in it's aims. With three more episodes to fill before the Royal Rumble, Smackdown needed somewhere to take it's biggest rivalry. Corbin offers somewhere for the feud to brand off for a while and will also benefit heavily from getting to work with Cena. The close of the segment with Cena looking to step up to Corbin, only for Styles to clock The Cenation Leader with the title belt, left things perfectly poised for a Cena v Corbin sub-fued, whilst keeping the main story in the audiences mind. This shift should be good for everyone building up towards 29th January, with Cena and Corbin set to face off on #908 next week. 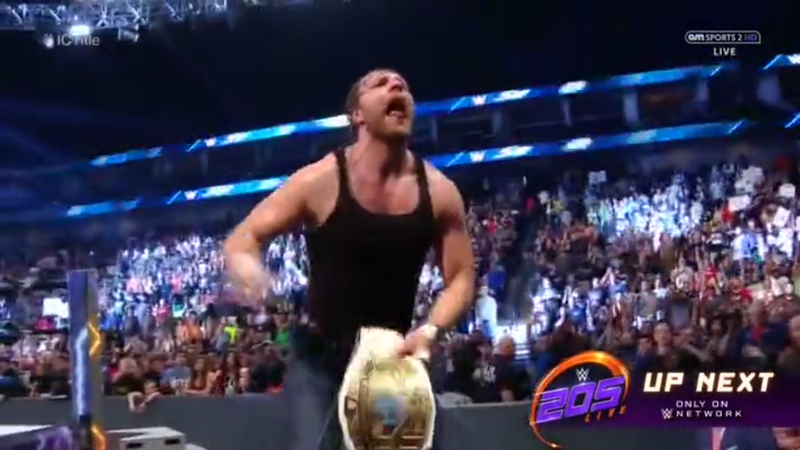 The main event saw Dean Ambrose pick up his second Intercontinental Championship after pinning The Miz with Dirty Deeds, in a good TV clash. The action wasn't always the slickest, but kept a nice pace throughout with a sense of importance and urgency behind each man's offence. Ambrose's elbow drop to the outside was a cracking way to come back after a break, whilst Miz beginning to focus on the leg after catching a big boot provided the match with it's main story device, aided by some strong from Ambrose (at least bell-to-bell). The referee not calling for the DQ after Maryse slapped The Lunatic Fringe, not only created a cool moment, but will also give Miz another reason to complain, whilst also showing up the character hypocrisy. I would've liked to have seen a decent stretch with Ambrose in the Figure Four to really make use of the amount of focus on leg, but that doesn't stop this one from kicking of Smackdown's 2017 strong. 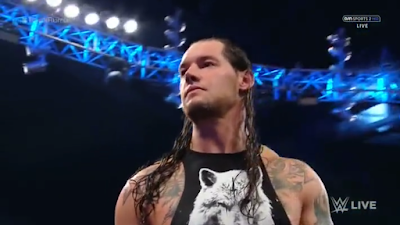 The show's opening match was a clash between long-term rivals Baron Corbin and Dolph Ziggler, with The Lone Wolf going over, leading to a Ziggler turning heel on both Kalisto and Apollo Crews later in the episode. Corbin debuted in April and this was their eight match together. EIGTH! With a roster so deep, how on earth does that happen? This match was much like every other one of their outings, not bad, but absolutely nothing to get excited about. For me, this match felt like a series of sequences and reversals that sounded cool in the back, but without thinking out clearly how they'd move from one spot to the next. This made the match feel pretty incoherent at points and took away from the quality of the sequences themselves. Sometimes throwing all your ingredients into a bowl, doesn't make a very good cake. In the opening segment The Miz called out Renee Young, with Dean Ambrose coming out to confront the Intercontinental Champion, only to get a slap from Maryse. Carmella defeated Aliyah in a scrappy outing, after James Ellsworth interfered. A weird in-ring segment, saw Natalya tell Nikki Bella that she was going to die alone, before Bella twatted Natalya with a forearm. Becky Lynch def. La Luchadora - Smackdown Tag Team Champions American Alpha (Chad Gable & Jason Jordan) def. The Fashion Police (Fandango & Tyler Breeze). A decent two hours of television, highlighted by John Cena and AJ Styles' contracted signing. The episode's two featured matches were both decent watches, with the main event for the Intercontinental Championship being the better of the two. I'd like to see the two hours begin to be used more effectively for the Women's and Tag Division, as whilst numerous stories were featured this week, none of them received the necessary time.